Context Discovery has created XMind Summarizer, a new extension to XMind: a great tool for searching on the Internet! How to summarize a web page quickly? How to find material relevant to my work on the web without losing too much time to read everything? Context Discovery has found a very satisfactory answer to this question: XMind Summarizer. 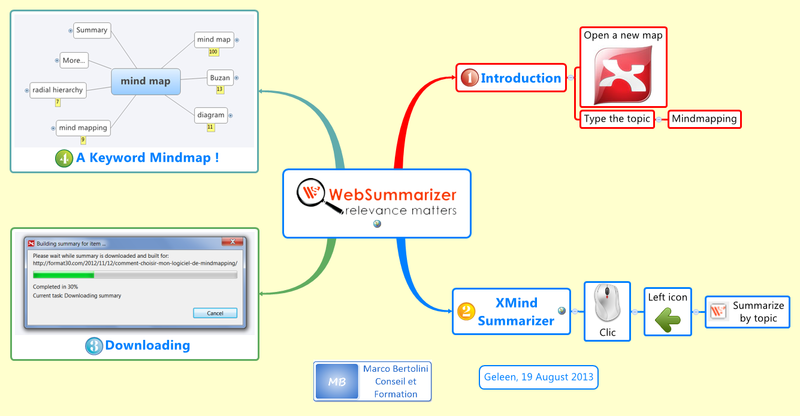 We already knew Web Summarizer, the online device that summarizes web pages as mindmaps. But Context Discovery, the Canadian company specializing in automatic text summaries, has taken a step further by proposing an extension for XMind. (Click on the picture to make it bigger. You can also download that XMind Mindmap and many others from my Profile on Biggerplate). This is the Polish company Smart XMind Extensions which broadcasts on the web: it is also the designer of XMind extensions for Outlook or systems time management and project that I will have the opportunity to talk. What is the XMind Summarizer extension ? It runs a web page, marks the relevant keywords, copies the sentences in which these keywords appear and organizes all in a mindmap. With the smart extension XMind Summarizer, all this happens automatically in XMind, as summarized in the video below. To install the extension XMind Summarizer is very simple: go to the XMind Summarizer page and sign up for the 30-day trial license: it’s free, but mandatory. Then, if the product appeals to you, there are several possible starting at $ 2.99 per week subscriptions. Finally, download the small program. Start your XMind, and you now have two more icons in your menu bar at the top of your screen: Summarize by topic, which takes the form of a red W in and white square and Summarize synthesized by a simple red W .
The first icon allows you to automatically summarize any Wikipedia page. You type the keyword you are looking for as a central topic of your XMind map. The good news is that XMind Summarizer works in several languages, including French: so you can summarize any web page in English, French, German and Spanish. Let’s do the experiment with two web pages in French on content marketing. I open a new XMind map and I type “Content Marketing” as the central subject. But this time, I do not click the “Summarize by Topic” icon, but on the other icon: Summarize. XMind Summarizer shows me a dialog with a field. I stick the URL of the first page that interests me. And XMind Summarizer starts to search. After a few seconds, I have a first branch on my mindmap with a series of keywords that match my search. I repeat the process with a second page and I get a second branch on my mental map XMind, with a different set of keywords for the page. When and how to use XMind Summarizer? Please do not use this XMind extension to study! 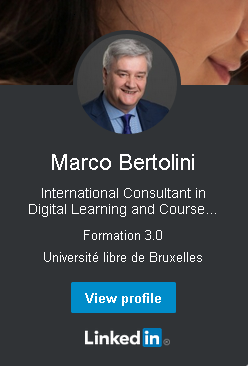 I wrote several articles on the subject and I am convinced that what facilitates learning by mindmaps, is the act of building the map itself. Because it uses different cognitive skills. If you use XMind Summarizer to do this job for you, you have no chance to understand and / or remember anything! By cons, this extension seems very interesting if you are a researcher, librarian or student. And you need to research on the web. Because, as I showed in the videos of this article, you can quickly access content from Wikipedia and other pages. And more, XMind Summarizer synthesizes the page content as keywords for you! It therefore seems very promising for those who must synthesize large amounts of information, which should conduct research on keywords, or should organize knowledge bases. 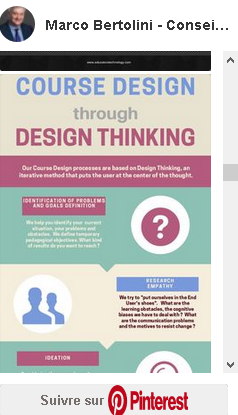 This application does not summarize either a text or a course in your place. To do this, you should also summarize yourself with a mindmap. But this extension will provide a working basis on which to build your resume. And that’s a lot! Previous Post XMind 2012 : with the revisions, you always know where you are !